A trusted plumber can help customers in making the right estimate of the costs associated with the repair or installment of the plumbing system. A quality plumber assures that the plumbing issue is addressed promptly and accurately. Choosing inexperienced plumbers to do something as expensive as a repairing a water heater can burn a hole in your pocket as these plumbers are not aware of the proper techniques that can stop any further damage to the water leak in the building. Credible plumbing services employ plumbers who are well-trained about the various aspects of plumbing, from unclogging drains to safety measures, which an inexperienced plumber would be unaware of. Also, certain plumbing issues like main-line stoppage require the presence of a professional plumber who understands the nuances and knows how to adeptly use the equipment to clear it out. Trusted plumbing services can acquire permits for situations that demand bathroom remodeling, re-routing existing plumbing, adding new lines or such. These plumbers understand the building codes, the process involved and recognize plumbing requirement that need permits to clear the inspection. Finding an affordable plumbing service is just as important as choosing a quality plumber. While the plumbing charges quoted by various Victorville, Lancaster and other High Desert plumbing and drain service providers may show considerable differences, picking a service that is consistent and reliable is crucial. 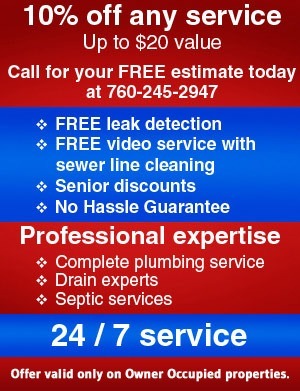 Needless to say, the prices quoted by a plumbing service does not necessarily reflect on the quality of service. There are many credible Victorville and High Desert area plumbing service companies that assure quality services at affordable prices. 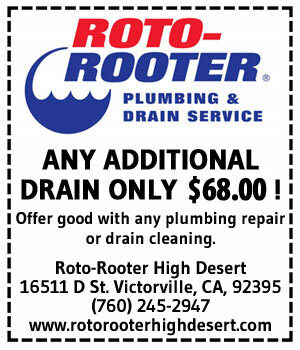 You can trust Roto-Rooter of the High Desert for all your plumbing, septic and drain service and repair needs in Victorville and Lancaster. Give us a call today at 760-245-2947 to schedule an appointment.